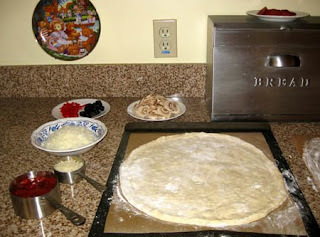 This photo of my latest pizza-making session reminded me of an early lesson in mise en place (which is pronounced MEEZ ahn plahs, "putting in place"), a French culinary term that refers to arranging all the necessary ingredients and equipment ahead of time. My mother's friend Maggie was visiting when I decided to make spaghetti for the first time. I was 13 and had been cooking for several years, so when the subject of spaghetti came up in our discussion I was ready to dive right in. Besides telling me how to make spaghetti, Maggie gave me a few pointers that day I've never forgotten. She said she always spread a sheet of newspaper on the counter and got out all the ingredients before she started cooking. Since I don't subscribe to a newspaper, I have to skip that step. But that day, years ago, I spread out the paper, gathered all the ingredients and equipment, then proceeded to do all my peeling and chopping with the newspaper catching all the mess. As the sauce simmered and the pasta water boiled, clean-up was a snap. It took mere seconds to fold up the newspaper and toss it. Of course, I didn't know it was called mise en place until years later. But it's a wonderful concept! If you've ever just jumped right into making something and then had to turn off the stove and run out to the store for a missing ingredient, you can appreciate the efficiency of having everything in place ahead of time. I did it! My blog was under Brad and family blog. I'll look forward to more cooking adventures. Noted your comment on Hummus and garlic. Lovely! Why yellow?! You mentioned on my blog you must always have a yellow kitchen. Mrs T, yellow was always my favorite color, and so I tried a very soft butter yellow in our first kitchen. We loved it so much, we painted our next kitchen that color. We've now had a yellow kitchen so long that we simply could never have one any other color!